1. Our Elite Sponsor, Flaman Fitness your source for top rated strength and cardio equipment, has generously provided a $200 Gift card. 2. TCR Sport Lab Altitude Lab Bringing the mountains down to you: Altitude Performance+ Acclimatization Gift Certificate ($239.00 value). Pre and post metabolic testing…Walk, run or cycle up to 5000 meters (17,000 feet). 3. Sauce Italian Kitchen a $200.00 gift card. 4. NOtaBLE Restaurant’s inspirational Chef Michael Noble and his amazing culinary team a $200 Gift Card. 5. RJ Barrett & Co. providing Financial Services and Chartered Professional Accountants the Fitbit Blaze Smart Fitness Watch. 6. Trolley 5 a brewery tour & Pitmasters Platter for 4. 7. Mama Massage a $200.00 gift card for two outstanding massage sessions, located in West Springs and inclusive of childcare. 8. Bow Cycle an ultimate his and her’s package including clothing, toques, water bottles and hot/cold drink containers. 9. A KitchenAid Easy Clean Juicer. 10. Calgary and area RE/MAX agents and Sundance Balloons a Champagne Hot Air Balloon Experience for Two. 11. Calgary Coop Wine Spirits Beer a $200.00 gift card. WIN the Top Fundraiser Prize at the 2018 Light It Up Calgary Run and Walk and go shopping at Flaman Fitness with $1000.00 in your pocket!Explore the high quality products sold by Flaman Fitness within their two Calgary stores and then spend $1000 towards the purchase of any in-store item. 1 in 500 chance to WIN! 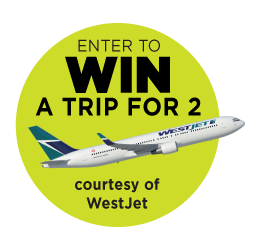 Thanks to a very generous contribution from WestJet, one lucky person will win a fabulous trip for two! Only a few tickets left…purchase yours now! $20.00 each. Have you ever wondered what it would be like to be a Firefighter? Donate or raise $25.00 for Wellspring Calgary once you are registered and qualify to win this outstanding prize offered by the Calgary fire Department! A once in a lifetime opportunity to participate in the CFD Fire Training Bootcamp! The winner and a friend will get to gear up and train alongside CFD firefighters and gain insights to areas such as driving, hose handling, vehicle extrication, high angle rescue, and search and rescue techniques.